All I have to say about what's going on is, Take your time! My favorite video game, Kingdom Hearts 3, is going to come out at the end of January. Square Enix, the company who is behind it, took over *ten years* to finish it. You can't rush perfection so, take your time! You'll do great and we'll love the game no matter what! i would love the option for gloves, and shorter dresses like tea lenght! im so in love with the body sizes!!!!!!!! 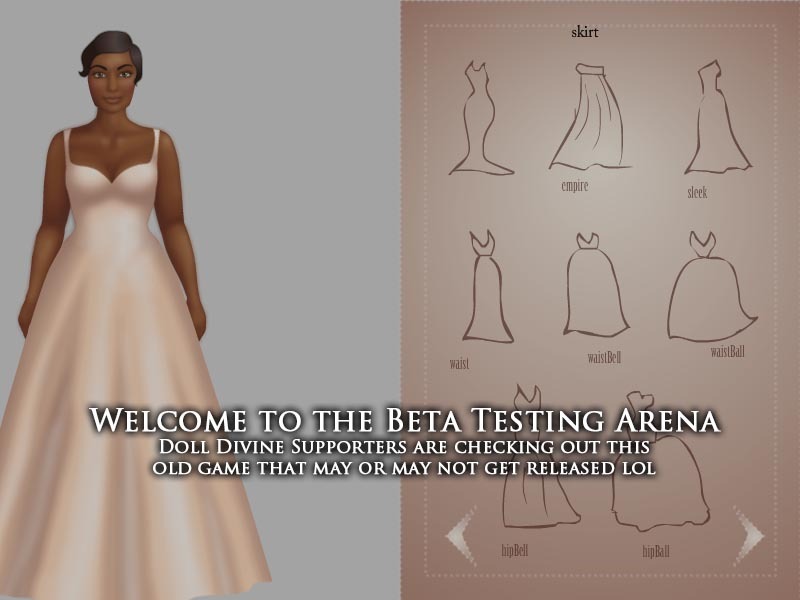 On the dress options, there is a gray box appearing around some of them. I love the size options too. i like being able to make dolls that aren't either pencil thin or distorted. I love the sleeves! Thank you! Well, I managed to add sleeves (not plugged in with fabric choices yet. And that took.. much longer than I hoped. Oh man, the underlying structure of this game is so complicated.. makes it a giant pain to add anything. So I think I'll try just adding a lot of draggies and letting ppl kind of sandbox it from there..